New year’s resolutions - easy to make and equally easy to break. If your resolution is to do more exercise and be more mindful in 2017, yoga is the perfect activity. It can increase your physical strength, balance and flexibility, as well as helping to prevent depression and stress. However, after the indulgence of Christmas people’s purses can feel a little empty in January, so we’ve rounded up some of the best low-cost or free yoga classes in London that will stretch you out without stretching your bank balance. Namaste! The London Buddhist Centre are dedicated to promoting meditation and Buddhism in a contemporary context, and this includes yoga. Their by donation classes run from Monday to Friday at 12pm, with evening classes on three of these days from 5:45pm. Stretch out in front of the giant Buddha and stay for the free meditation classes afterwards, perfect for achieving a zen attitude even amidst the hustle and bustle of the city. 51 Roman Road, Bethnal Green, E2 0HU. Find out more here. Just a few minutes away from the Buddhist Centre you will find East London Community Wellbeing at the charity St Margaret’s House. 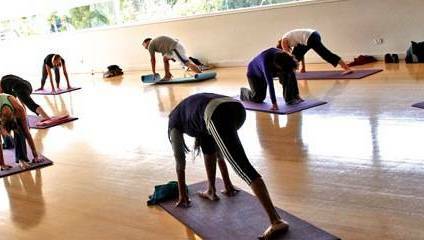 Alongside some very reasonably priced regular classes there are some by donation sessions, including everything from dynamic and vinyasa yoga through to slow flow and hatha yoga. St. Margaret's House, 21 Old Ford Road, Bethnal Green, E2 9PL. Find out more here. Think that cheap yoga is completely off the cards in Central London? Think again. The London School of Economics runs cheap yoga classes for students and non-students alike. Classes are just £6 for non-members, a true rarity in Central London. Old Gym (Old Building, Lower ground) of the London School of Economics, WC2A 2AE. Find out more here. You’re spoilt for choice for yoga at Yogarise Peckham, and alongside a regular membership they also offer frequent community classes that are by donation. These sessions are often taught by new or training yoga teachers and are a fantastic opportunity for people of all levels to get involved with yoga. B2.1, Bussey Building, 133 Rye Ln, London SE15 4ST. Find out more here. If you’re more interested in the meditation and mindfulness side of yoga, Sahaja yoga sessions are a true gem. They have branches everywhere from Balham and Crystal Palace to Hackney and Walthamstow, and each session will gently lead you through a process of self-realisation, culminating in deep inner meditation. The best thing is that every single session is free. Find Sahaja at locations across London, find out more here. Lululemon make athletic clothes and generally promote exercise and a healthier life. The Spitalfields branch run a complimentary yoga class every Sunday morning, the perfect way to work through that hangover and revitalise yourself for the week ahead. These sessions are first come first serve and are very popular, so remember to arrive early. Lululemon is at 109 Commercial Street, Spitafields. Find out more here. Stress is a natural consequence of life, but too much of it can put a strain on our bodies. Luckily the residents of Holloway in North London have set up a group initiative to combat stress, including a low cost yoga class every Wednesday. Costing just £2, this is the perfect way for North London locals to wind down during their lunchbreak. Old Spitalfields Market, London, United Kingdom. Find out more here. For those who live near North Battersea and want to give yoga a try, there is a complimentary hatha yoga session every Tuesday evening. The class is designed for beginners wanting to learn and acquire some of the health benefits before possibly moving on to more advanced classes. Nine Elms Lane, London. Find out more here. The Special Yoga Foundation encourages yoga practice in all ages and abilities, including a fantastic selection of low-cost sessions. Their Yoga For Stress session runs every Tuesday from 1-2pm, and catch their Beginners Integral Hatha from 7-8:30pm every Thursday, both for just £6. Unit 7, Portobello Dock, 557 Harrow Road, London, W10 4RH. Find out more here.